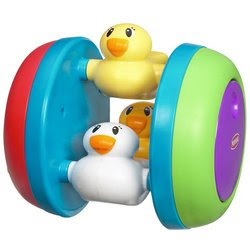 A natural toy for babies at the threshold of crawling, this duckie-themed rattling, rolling toy inspires your little one to scoot across the floor! Give it a push and encourage your child to follow, or use the open-and-shut sliders to engage Baby in the cheerful back-and-forth play! 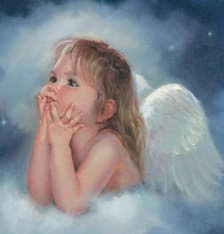 Engage with your little one as you show baby duckies eyes opening and closing. Stimulate baby's senses with the clicking dial. Roll the toy for baby to chase and send the ducks and goose on silly, spinning stroll across the floor. It's stack-and-pop, peek-a-boo play! 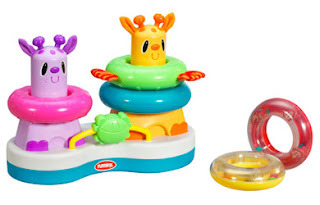 Count the colorful rings one-by-one as you stack them on the cute little giraffe characters. Once they're all stacked and counted, press one giraffe down to make the other giraffe pop up! Each ring has a unique texture or sound to help your baby discover the world of sight, sound and touch. Includes five rings and play-along tip card. Measures approximately 21 cm.